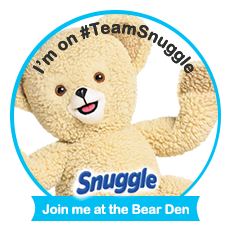 As a member of Smiley360 I get the chance often to try new products! When I was asked if I wanted to review the Arm and Hammer Simply Saline™ Neti Pot Kit I jumped on it quick! With this time of year everyone in the house has some sort of nose problem. The Arm and Hammer Simply Saline Neti Pot naturally eases nasal dryness and helps clear congestion associated with colds and allergies. The saline solution is made with real Arm and Hammer™ Baking Soda to help prevent stinging and burning. Simply Saline’s pot has a patent pending, leak-proof design to help avoid messy spills. 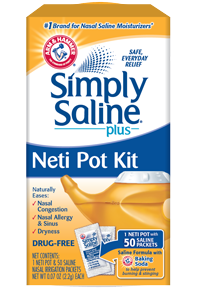 Simply Saline™ Neti Pot Kit is ideal for flushing out nasal mucus and allergens. Simply Saline™ Neti-Pot solution is made with salt and real ARM & HAMMER® Baking Soda to help prevent burning and stinging. 1. clean the pot prior to the first use. Fill the Neti pot with warm water to the fill line. That's about 8 oz of water. DO NOT use Hot or boiling water. 2. empty 1 simply saline packet into the neti pot. 3. lean forward over a sink with your head tilted to one side. Open your mouth and apply tip of the neti pot snugly against your nostril. Allow the solution to gently flow until it starts draining from the opposite nasal passage. Avoid swallowing the solution. 5. repeat steps 3 and 4 on your other nostril. Discard any remaining unused solution down the sink. You can purchase the kit at local drug store for around $12. I found it very easy to use and my nose felt so much better! I had never used a neti pot before and i will be continuing to use the Arm and Hammer neti pot! disclosure~ I received a Arm and Hammer Simply Saline plus Neti pot kit from Smiley360 in order to write this review. I have not received any other compensation for my review. All opinions are my own.